Chinoiserie... that inventive fusion of Asian motifs and European sensibilities, can be whimsical, graceful, and theatrical. 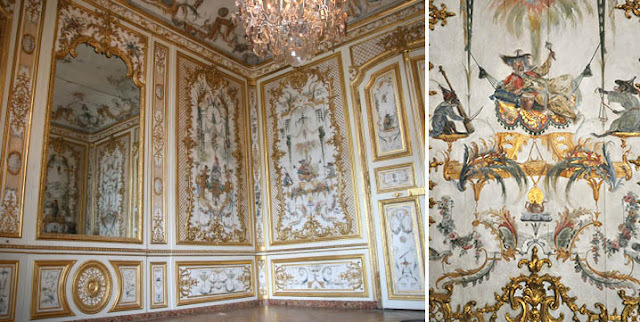 A major design phenomenon in the 17th and 18th centuries, it continues to be one of the most enduring and fanciful decorative styles in interior design. I became fascinated with chinoiserie through years of restoring and repairing hand-painted wallpapers and pieces of “japanned” furniture, studied its history and techniques, and eventually started painting some of my own designs in similar fashion. It seems to me that every era has created its own version of chinoiserie, to emphasize exoticism and escape, or sometimes to be simply colorful and uplifting. In all cases there is a fairy tale dream-like quality that never fails to be charming. Increased trade between Europe and China in the 17th century sparked a passion for all things oriental. What started with imports of commodities like tea, porcelain, silk, and saltpetre, grew to include a new cargo: a revolution in design. The growing vogue for rare chinois artifacts inspired fanciful imitations from skilled artisans all over Europe. Oriental motifs both real and imagined, with pagodas, birds, monkeys, and figures in exotic costume, were worked into all manner of fine and decorative arts: everything from garden teahouses to japanned tea boxes were created in a Europeanized oriental fashion. An original and new style was born- not just from the Chinese influence – but far more from the inspiration borne of it. The new decorative style was popularized by the French court of Louis XV, as the curves and whimsy of Chinoiserie integrated beautifully with Rococo architectural features. Soon it became all the rage, with all the royal palaces of Europe creating glittering theme rooms and entire pavilions to house their collections of oriental treasures. Over the next hundred years the mania for Chinoiserie spread across the Western world, in fashion, furniture, and interiors, even in theater and opera. 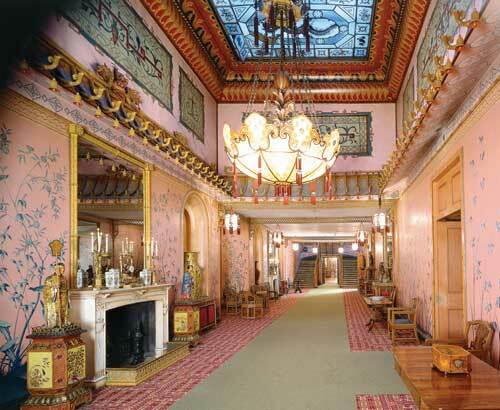 No palazzo, schloss, or manor home was quite complete without its Chinese room. 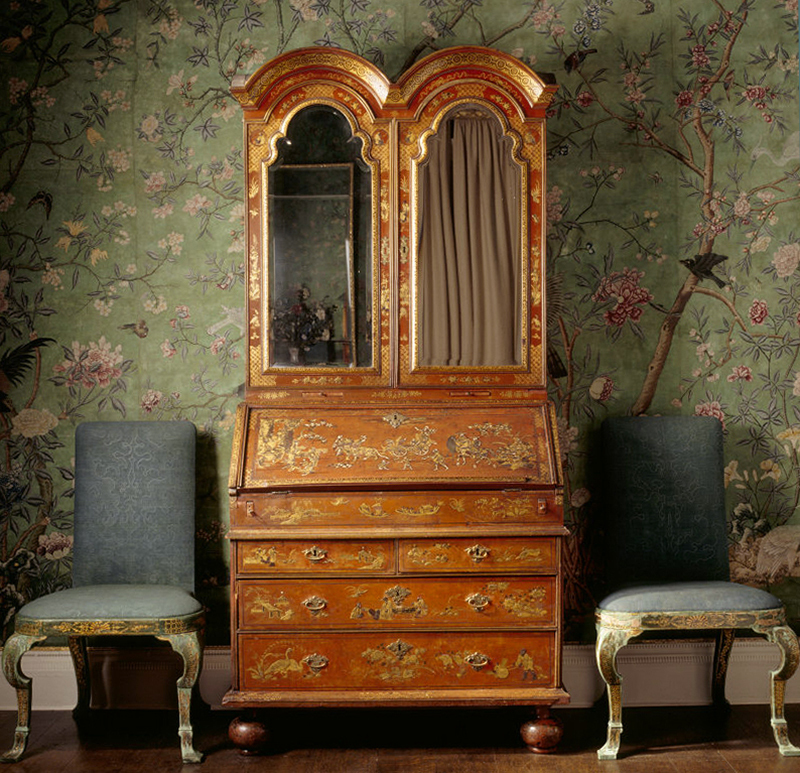 In early American interiors Chinese objects and fine, hand-painted wallpapers played a significant role and influenced design in the young United States for generations to come. For a growing nation that longed to be part of the rest of the world, the blending of eastern and western cultures was a symbolic and powerful idea. Early in the 18th century, the first hand-painted wallpapers were imported from China by the East India Company, and so were sometimes called “India papers.” Produced in China exclusively for the western market, they featured exotic looking flora and fauna delicately painted in brilliant colors on paper silk. You can see breathtaking examples of these early India paper murals in the Chinoiserie rooms of historic palaces at Hellbrunn (Salzburg), Oranienbaum (Russia), Drottningholm (Sweden), Sans Souci (Potsdam,) and Schloss Charlottenburg (Berlin.) At Nostell Priory in Yorkshire, famed English designer Thomas Chippendale used floral wallpaper murals in rooms filled with faux bamboo chairs and japanned cabinets. Then, when you think you’ve seen everything, there’s the Royal Pavillion at Brighton, the spectacular pleasure palace built for King George IV. Completed in 1822, and is the ultimate example of the late Chinoiserie style, with its opulent, fanciful interiors and room after extravagant room filled with handpainted Chinoiserie papers, ornament, and ceiling murals. 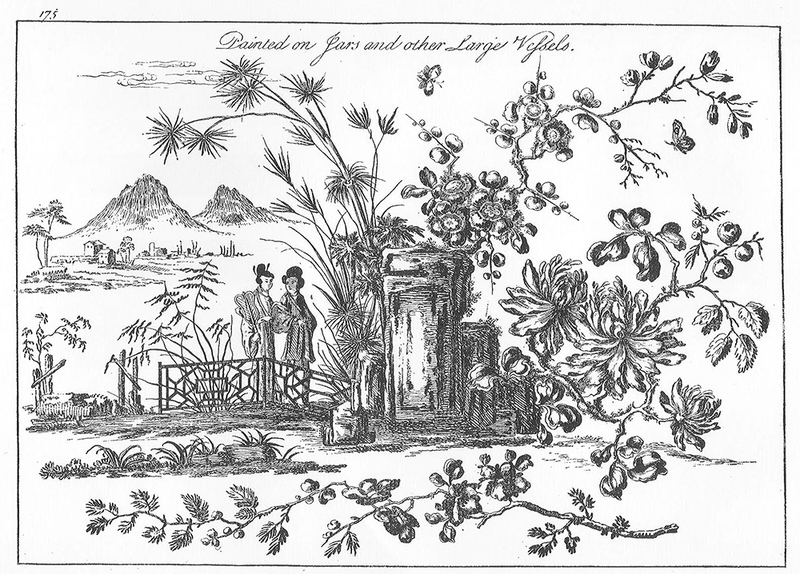 18th century classicists argued that the Chinoiserie style was ‘a ridiculous hodgepodge of serpents, dragons, and monkeys’ and maybe it was, but then, even the most understated neoclassical Georgian house often had rooms whimsically decorated with floral murals “in the Chinese taste;” a pagoda folly in the garden; surely a pair of gilt brackets with blue and white porcelain vases, at the very least. Robert Adam himself more than likely trotted about his home in a banyan and turban, as did most gentlemen of his day. A general revival of orientalism in the late 19th century found theatrical Chinoiserie theme rooms at the height of fashion once again in Victorian homes, providing a serene escape from bustling industrialized cities. 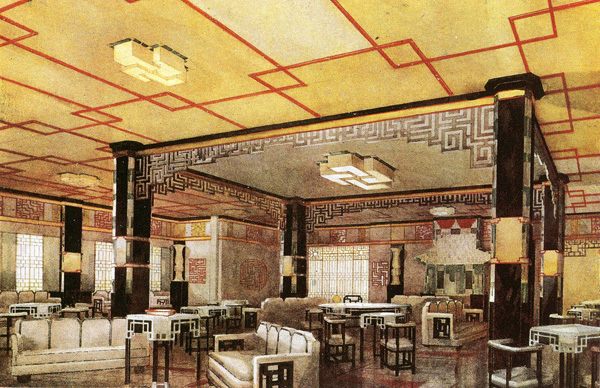 From boudoirs to movie palaces, Chinoiserie figured gracefully into Art Deco and “Hollywood Regency” interiors, the exotic orient representing languor and wistfulness in an era of speed and new technology. Throughout the 20th century designers from Sister Parish to Tony Duquette used Chinoiserie to add opulence, color, and grace to their designs. 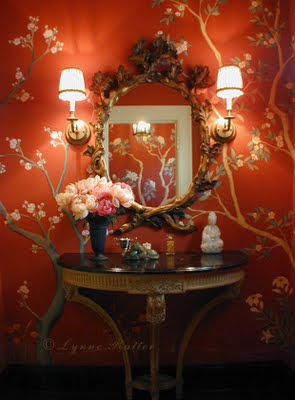 Now considered a “classic” look, chinoiserie is very much on-trend as a versatile component in contemporary interiors. Wallpapers are still being painted in China for companies like by DeGournay, Gracie, and Fromental, and are in high demand all over the world. Contemporary muralists Jennifer Carrasco, Scott Waterman, Nora Johnson, and of course, Lynne Rutter, have all painted current styles of chinoiserie for their clients, each with a different spin on the traditional form, while top interior designers are incorporating chinioserie murals, furnishings, and accessories into their work in fresh new ways. Is this a Chinoiserie revival, or the perennial flowering of an immortal style? Chinese Wallpaper in Britain by Emile de Bruijn: the author of one of my favorite blogs has finally put out a fabulous book with great images and information about the Chinoiserie papers I adore!! Flowering Chinoiserie: Painters who share this obsession may want to consider taking this workshop on creating your own chinoiserie murals! I just found you. It's like Christmas for me. Putting you on my side bar. 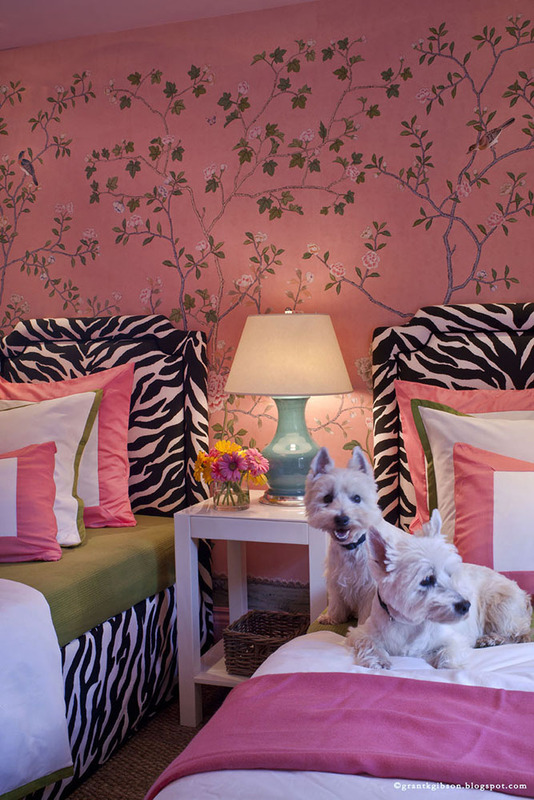 Hi, Lynne - Your mural for the San Francisco Decorator Showcase is very handsome, as is the photo. In my own portfolio, I'd want to lead with such a dramatic statement! I really enjoyed this concise history. 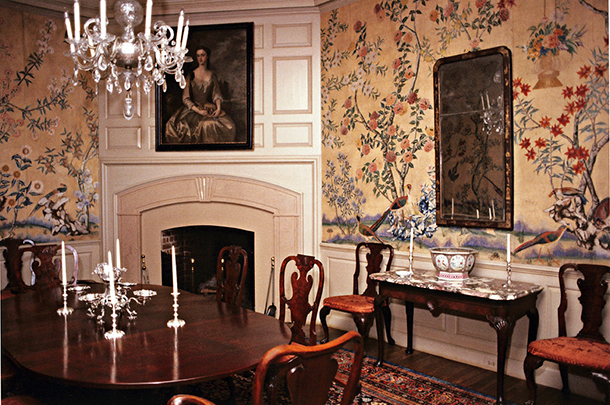 It reminded me of my own introduction to handpainted Chinese wallpaper, at the Governor's Mansion in Williamsburg. The wallpaper is painted with branches similar to your own design, and with many pairs of birds. Docents always point out that there is only one single bird, an owl. THIS WAS LIKE A WONDERFUL HOLIDAY, WHAT A FANTASTIC POST. I HAVE PUT YOU ON MY SIDE BAR. Great post! I've some of the similar work you've posted before, but wasn't familiar with the history behind the style. Thank you! Jesse, Yvonne, thanks for commenting and welcome! Mark, I hope to visit Williamsburg next week when I am in Virginia. Is the room in this post the same one that you saw? it's so colorful and so much less visually cluttered than modern wallcoverings. I really prefer them when they are more open compositions. (applause) Bravo! I so enjoy these kinds of posts and information. It IS a true meeting between the Western and Eastern worlds. My view is that it's on the side of an eternally beautiful style. Hi again, Lynne - I'm amazed to be able to say that it's been about 40 years since my last visit to Williamsburg! Despite the fact that there are some birds in the wallpaper of your posting, I don't think this is in the Governor's Mansion. I seem to remember the color as blue/gray/silver - in that range, rather than gold. I envy your trip, not just because I really enjoy Williamsburg, but also because I know the folks there are in a continual process of renovation and restoration. I was talking to someone from Williamsburg who told me that the foundation had gone so far as to even breed Williamsburg sheep back to the original stock!